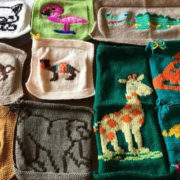 An advantage of this free crochet Chain Stitch square pattern is that since there is no end to the rounds, you can tie on a new yarn when your previous yarn ends. You can also alternate yarns ’round by round’ to make it look stripy. 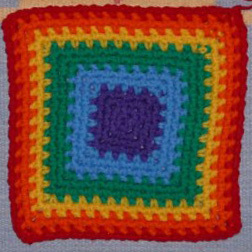 To make the Chain Stitch square, ch 5, then join with slip stitch to first chain to make a circle. Round 1: Ch 4, 1 sc in circle, ch 3, 1 sc in circle, ch 3, 1 sc in circle, ch 3, sc in first loop of round 1. You now have a circle with 4 sc and 4 loops. From now on you work around and around, without joining rounds and going up to the next. Continue working around, always working 1 sc in each ch 1 space, and 1 sc, 2 ch, 1 sc in each 2 ch space corner. When you reach 8” (20cm) across you are done. It looks neater if you end on a corner. Fasten off, leaving a 20” (50cm) tail which is used for sewing the squares together. 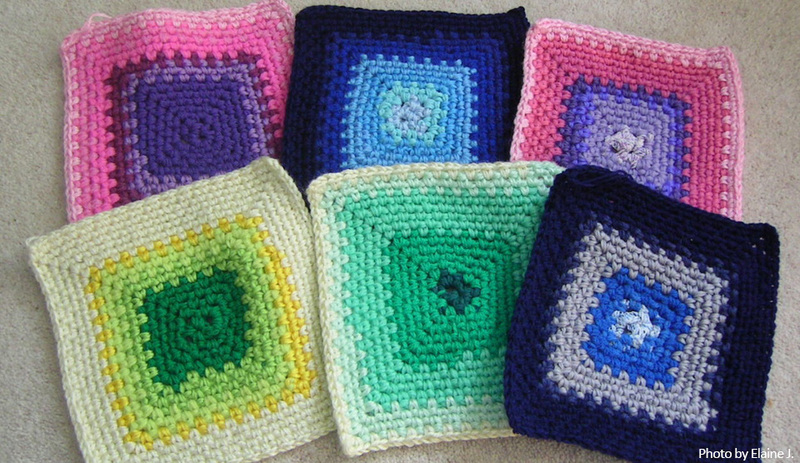 Fun yarns can be included for a row or two to give the square interesting texture. Leave a 20” (50cm) tail, used for sewing the squares together. Butterfly the tail to the square. 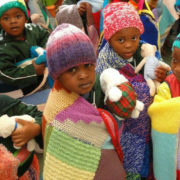 Knit-a-square South Africa, a partner of CreateCare Global.